We landed at the airport airport at around 11am then we got an uber to our hotel Pentahotel Prague which was a little bit out of the city centre in Karlin but it was fine for us. You can also get to Prague city centre by taking the 119 bus and changing to metro Line A or B it just takes a little bit longer. I booked a walking tour for 1pm online but the first thing on our mind was food! 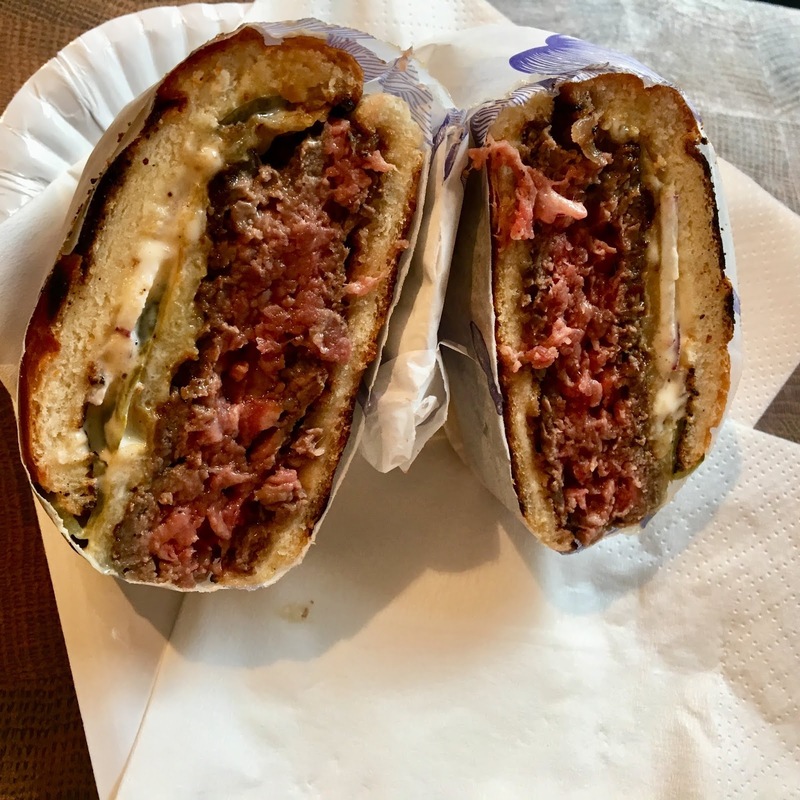 Before the trip to Prague I researched the best places to eat and drink and this was one of them. 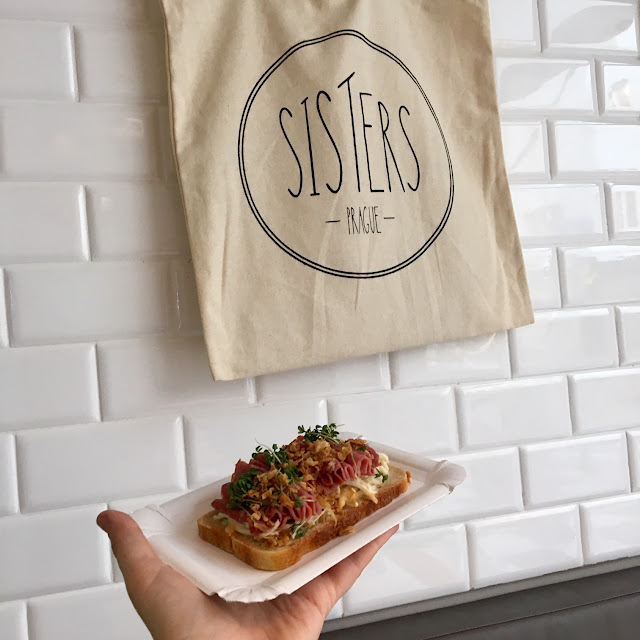 Bistro sisters focuses on the “chlebicek”, the classic Czech open-faced sandwich, with various toppings. As we arrived quite late there wasn't a lot of options but we got to taste the roast beef and goats cheese with beetroot which were both delicious! 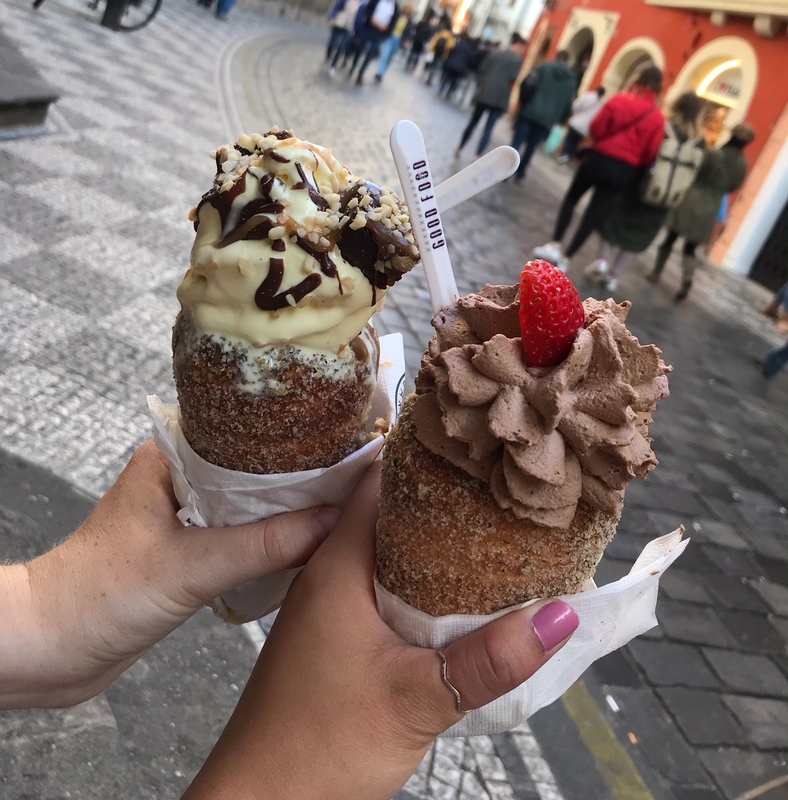 This is just one of many traditional foods in Prague! After eating we went to the meeting point in the Old Town Square where Jeremy our enthusiastic tour leader was waiting, not only did he have a huge passion for Prague but also history and politics. The three hour tour covers the Astronomical Clock which draws crowds every hour when it chimes, Old New Synagogue & the Golem, Old Jewish Quarter, Wenceslas Square, beautiful art nouveau architecture and lots more! 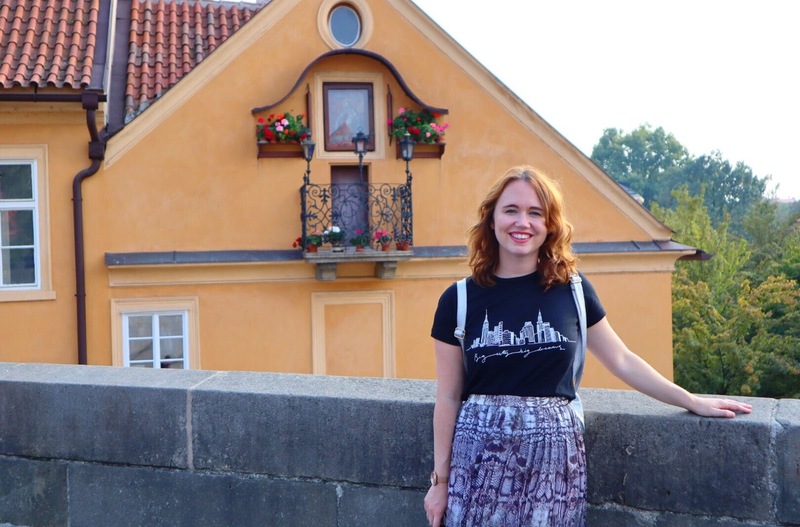 I recommend doing one when you first get to the city so you get your bearings and learn all about Prague's history. Because we had been awake around 15 hours at this point, we wanted to stay close to our hotel for dinner so we had a quick look on google maps and tripadvisor and came across Nejen Bistro. With a local vibe and an open kitchen using fresh, seasonal ingredients from local farmers, this bistro had a small menu but with plenty I liked. I ended up choosing the Octopus which came with chorizo and cost a reasonable £14. My friend opted for the Maminha which is Brazilian beef, both dishes were presented well and looked quite small but was extremely filling and tasty. They also served Aperol spritz which is my fave! Other places that looked good near Pentahotel were Pivovarský klub, Lokál Hamburk and Krystal Bistro. 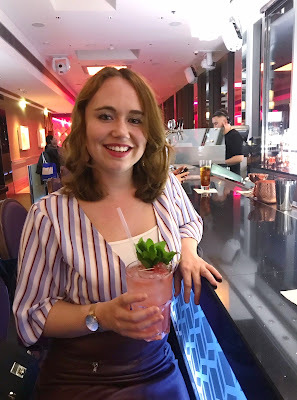 There are many rooftop bars in Prague but the Cloud 9 inside the Hilton hotel was close to our hotel so we thought we would go and see what all the hype is about. Being a Saturday night it was quite busy so we couldn't get a table by the window but we managed to get a seat at the bar where I ordered a watermelon cocktail which was delicious. I would recommend seeing the view in the day because at night there isn't a lot to be seen but the atmosphere, staff and decor are lovely. After a much needed lie in and a huge breakfast at the hotel, we we're ready for a day of more sightseeing in beautiful Prague. According to the Guinness Book of Records, the Prague Castle is the largest one in the world dating back to the 9th century. Prague Castle is essentially a small town on a hill overlooking the city so you need to get the tram or metro to it as it's quite far out to walk. There are a few different ticket options depending on what you want to see however we opted for ticket A (approx £12) which included entry to St. Vitus Cathedral, Old Royal Palace, exhibition "The Story of Prague Castle", St. George's Basilica, Golden Lane with Daliborka Tower and Rosenberg Palace. I really enjoyed the Golden Lane where the houses have been restored to show what they were once used for and the St Vitus Cathedral is really impressive not just from the outside but the inside too. If you don't want to pay anything you can just walk around and see the buildings from the outside and also enjoy the beautiful gardens. The royal gardens in particular had the most beautiful Autumnal tree and the views of Prague's rooftops from the castle are pretty spectacular too. After spending a few hours around the castle complex we decided to walk towards the Kampa area where we stumbled onto the Little Venice area of Prague which is also conveniently located close to the Charles bridge. I have to say it was one of my favourite parts of Prague and very quiet compared to other areas. Having travelled to Budapest before which also has many famous bridges I was surprised in comparison at how busy this one was! So many vendors and people taking pictures but it was still really beautiful. The pedestrian only bridge connects the Old Town with Prague Castle and is lovely to just walk along and take in the impressive fairy tale views. Trdelnik (chimney cake) is a Czech cinnamon pastry that can be found all over Prague but the best place for it is Good Food conveniently located close to the Charles Bridge. There was a massive queue outside but they served me my brownie topped Trdelnik really fast and it tasted amazing! After changing for dinner, we arrived by the River Vltava which is the longest river within the Czech Republic for our boat trip. I booked this through Viator but they run every hour so you can easily book one there. Once on the boat you can stand at the end or sit inside but I recommend standing if you want to snap some pictures and take in the views. 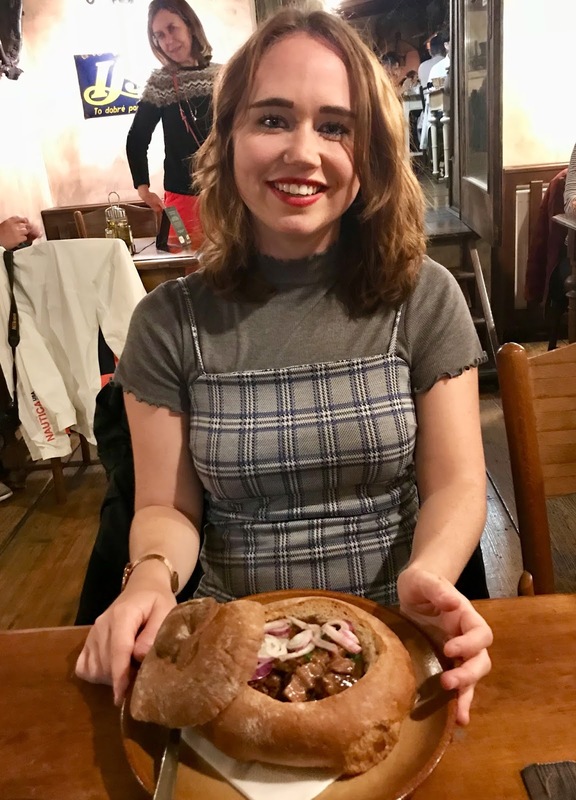 In the evening, we headed to a traditional Prague restaurant called Restaurant Mlejnice in the quieter part of the old town which meant we were joined by plenty of locals. There was a queue for a table but we only had to wait 10 minutes and it was definitely worth the wait. We ordered cabbage pancakes and brie to start and then goulash in bread for main, on the side we ordered potatoes with broccoli, mushrooms and edam cheese to share. 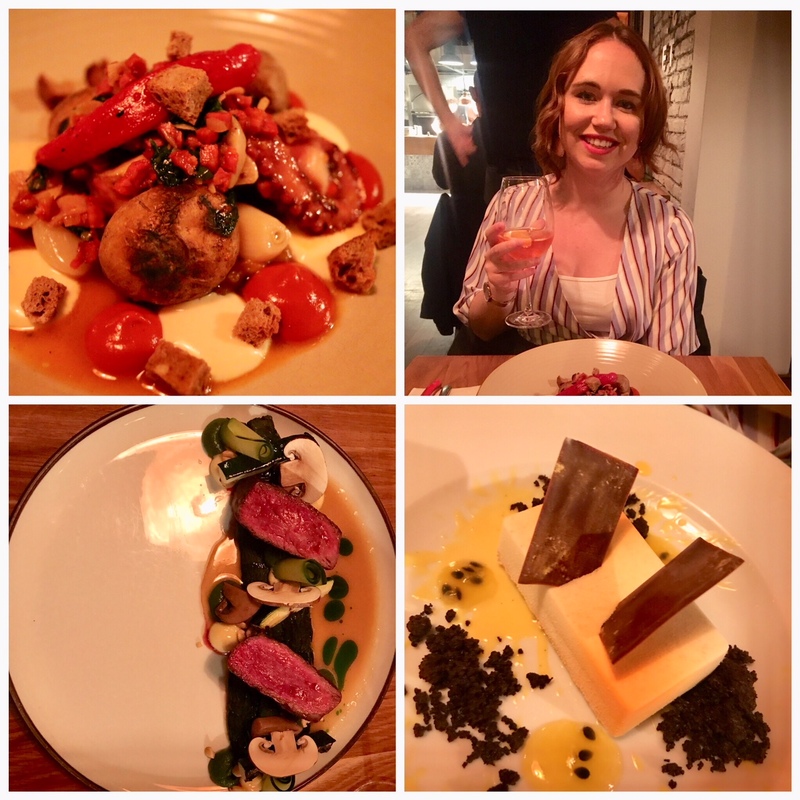 The bill came to less than £20 each which was an absolute bargain for how delicious the food was. After dinner we wanted to go somewhere for a drink with music. We stumbled upon Bar 1402 after hearing the Irish music playing and could see there was a good atmosphere. Inside its fairly small but with reasonable drink prices and a great singer we stayed all night! One feature that was cool, was all the stickers on the walls saying where people were from who had also drank at this bar! By our last day we had pretty much seen most of the touristy parts so we decided to just go back to the old town, do some shopping and just have a little wander in the sunshine. The Old Town Square is one of the busiest parts of Prague which lots of food vendors, outdoor cafes, walking tours and it is also surrounded with stunning historical buildings. The Old Town City Hall with the famous Astronomical Clock, the imposing St. Nicholas Church and Church of Our Lady before Tyn. There is also the monument of the Protestant reformer Jan Hus, situated in the middle of the Old Town Square since 1915. The whole square is also bordered by a large number of colourful houses which I would say are very instagrammable and reminded me of Amsterdam. After wandering around Prague, admiring the architecture at every turn, it was time for a spot of lunch. I had heard great reviews about Nase Maso (next to Bistro Sisters) a traditional Czech butcher shop serving meat and hot food and the queue outside confirmed it! Although their dry-aged beef burgers were a little pricey at around £9 it was totally worth it! I would even say it was the best burger I had ever had! Every country I visit, I have a tradition that I always buy a fridge magnet. So when we did our walking tour on the first day we passed a shop just dedicated to magnets (I was very excited) so we came back on our final day to get some souvenirs for our family. This was situated down a side street off the Old Town Square. Before we flew home we decided to get a much needed chocolate fix and visit a cafe called Choco Cafe which is just dedicated to chocolate! Warm and cosy inside, they have two locations in Prague and offer the best hot chocolates. The also sell chocolate bars in various flavours as well. 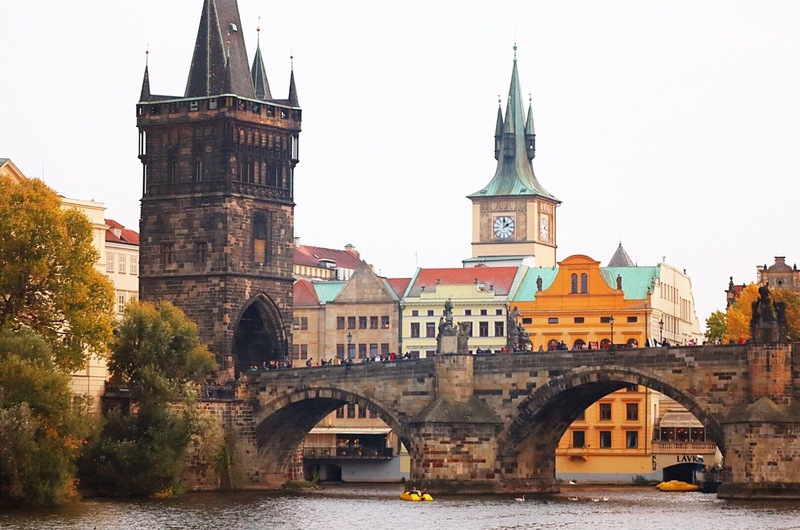 Have you ever travelled to Prague? Gorgeous photos, I didn't realise Prague was such a good hub for food. I've never heard of a chlebicek before but now I really want one!